Rescuers in Croatia recently received an unusual call to retrieve a bear that had fallen into a deep pit. 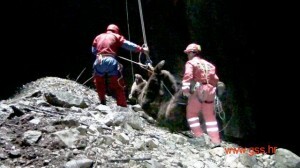 The owner of a local tourist hunting agency requested help from the Croatian Mountain Rescue Service (Hrvatska gorska služba spašavanja) on Saturday April 20th after a bear they had been hunting disappeared into a previously unknown pit. Arriving on scene, the pit was surrounded by anxious hunters, guides and foreign visitors. As bears are valuable hunting trophies in Croatia, and hunting them is hugely important to the tourist industry the team decided to do what they could to assist them. As a first step, the team descended the pit to determine if the unfortunate bear was still alive. After an initial 25 meter (75 foot) steep slope, there was a 20 meter (65 foot) vertical climb as the cave rapidly began to bell out. Reaching the bottom, the now dead bear was found, as were many bones indicating that he was not the first to fall into the deadly trap. Determining that it was safe to proceed, the rescuers then employed their special equipment and techniques to raise the carcass to the surface. After an hour and a half of effort, the rescuers had successfully brought the 90 kilogram (200 pound) bear to the surface for eventual display in the game room a rich foreign hunter. The Croatian Mountain Rescue Service is a volunteer, not-for-profit and public organisation that is specialized in rescuing in mountains, on rock faces, in caves and other unapproachable places. Although they do not support hunting, this unique “rescue” was undertaken as a small way to contribute to the Croatian economy, of which hunting is an important part, during the presently difficult financial times.